Martingale Dog Collars offer an alternative approach for dogs whose necks are a bit larger than their heads. These dogs tend to easily slip out of the more traditional dog collars. The Martingale collar is sometimes known as the Greyhound dog collar because these dogs have larger necks and smaller heads. These collars are designed to gently tighten when pulled so that the dog does not choke themselves or damage the trachea. The Martingale collar is considered a more humane alternative to chain choke collars. Doggy In Wonderland offers a variety of Martingale dog collars to choose from. Browse around and see which one best fits your dog\'s personality. Brigthen up their day with this rainbow of colors cog collar lined with blue. These martingale.. Your dog will be stylin' in this camo Martingale collar. This collar is engineered to prev.. Dress up that pup in this rainbow of of cotton candy colors. Cutie Collars' Martingales ar..
Go western in this classic red cowboy design. This Martingale is engineered to prevent "s.. Your dog will flash with style in this racing flag themed dog collar. This martingale is desig.. This wonderful mix of greens and blues make this a fun dog collar for your fur-baby. Cutie Collar..
Get your fur baby ready for spring with this floral design Martingale collar. It is engineered to pr.. Spruce up that pup in this Giraffe. Choose between the blue lined or red lined collar. This co..
Spice up your pooch's look with this cute leopard print dog collar. 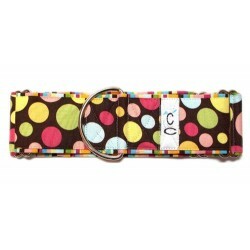 Cutie Collars' Mar..
Let your dog lead the pack with this chocolate with multi-color polka dots Martingale collar. .. Dress up your little girl in the pink leopard print dog collar. This martingale collar is made to pr.. If your little one looks good in purple, this collar is just the ticket for him or her. Cutie Collar.. Your dog will look bright and jolly in this colorful rainbow lined with red trim. This marting.. Your dog will feel like a king in this custom made all cotton Martingale collar. This dog coll..
Brighten your dog's day with this bright and fun Martingale collar. This collar is designe.. This dog collar is sure to make your doggy stand out in a crowd with its popular zebra print and hot..